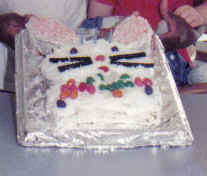 I made this bunny cake because, my youngest son latched onto a stuffed bunny when he was six months old. From that moment on, everything had to be about bunnies. I've made everything from Mr. McGregor's garden to whole bunnies. But it all started with this simple oldie but goodie...the bunny head. I have two boys and they like Mom's cakes best so no bakery cakes for us. I don't have fancy cake molds or equipment and I work full time. So, I rely on imagination and luck! I began with two layers baked in 8-inch round pans. When these cooled, I placed one on the serving tray as the bunny's head. The other cake was cut into three pieces following the lines of a basketball. The result is two ears that are feather shaped and the center piece is shaped like a bow-tie. Next, I made white butter cream frosting and covered the entire cake. (I have also made chocolate frosting for brown bunnies.) Next, I added flaked coconut to the head and outer part of the ears. I tinted some coconut pink to fill the delicate insides of the bunny's ears. Jelly beans and licorice formed the bunny's face. For his bow tie, I did not use coconut because not everyone at the party liked coconut. I let my son decorate the tie with jelly beans any way he liked. It was a hit and he loved the cake. So simple....but from the heart. I made the same one for my niece's bday a few years ago, she collects rabbits.